I thought the fit and finish was good, rattle free and some nice details such as stitching on the dash. It seemed comparable to my wife’s ‘16 Civic which is a good thing. The engine sound is ok. smooth and quiet down low 1500 to 2000 rpm, which is where the transmission wants the engine to live at. But, give it the boot, and there is a lot of noise but not much grunt. It’s a reminder that the 2.4 liters is pulling 3500 pounds around. The MultiAir engine is unlike any other in that there is no throttle, it’s magic with cams. Neat stuff but would I trust it to last 100,000 miles. Time will tell. This is worth a watch. The 9 speed transmission is interesting. I found the more gentle I was with throttle, the better things played together. Granted this is a 2.4 but if you push hard, it drops like 4 gears and all the sudden you have redline noise without a lot more grunt. One other thing was at cruise control at 45 mph, it seems to do some searching for the right gear, so I wonder whether a 9 spd is better than a CVT. This is one area where I think the Civic CVT works better. 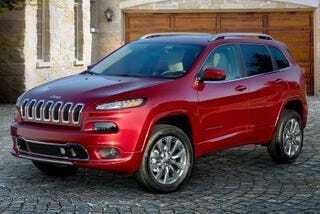 All in all, the Cherokee was smooth, quiet, had good stereo and excellent backup camera. It delivered 25 mpg at 50/50 city/hwy. It consistently over 30 mpg at 70 mph. Given it’s on rental lots, I suspect Jeep is interested in dealing. It’s worth a look.